American football is a Thanksgiving tradition, but so is soccer. 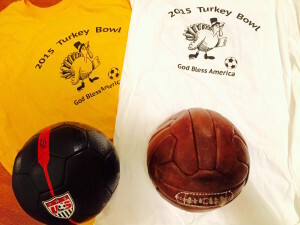 In fact, Thanksgiving Soccer is nearly as old as the holiday itself. A day of national thanksgiving goes back to the colonial period, but it took President Abraham Lincoln to institute it as a late-November holiday. Modern soccer, codified in a London tavern in 1863, has been played on American soil on Thanksgiving Day, and through the long weekend, almost every year since. Today, youth players enjoy turkey, trimmings and tournaments, but so did their soccer-playing forbears. That long tradition dates back to the 1870s in the neighborhoods of Kearny, Harrison and East Newark, New Jersey, one of the original cradles of American soccer. Soccer matches on Thanksgiving received regular coverage in the local newspapers beginning in the early 1880s. Employees from Clark Thread Mill formed an athletic association in the summer of 1883, and that Thanksgiving a team of bachelors beat a side of married men in the first-ever match on the thread company’s new field. ONT FC, short for “Our New Thread,” became the sport’s first American dynasty, winning the American Football Association Cup in 1885, 1886 and 1887. The area also produced some of the early game’s best players and even hosted this country’s first unofficial international on the Friday after Thanksgiving, 1885. A picked team of Canadians defeated an American all-star team comprised almost exclusively of local talent at Clark Field that year, but the Americans avenged the defeat a year later on Thanksgiving Day. Thanksgiving association football, later to be called soccer, has been a fixture in the area ever since. A more recent group started their own Thanksgiving morning match in 1976. These bicentennial booters—James Harrison, Steve Miller and Chris Kennedy—were all home from college and wanted to kick the ball around with their former high school buddies. We’ll let these founding fathers, and some others, tell you about “our football, our soccer” and how this American soccer tradition will go on forever. THANKS. ….IT’S IN OUR BLOOD…..!